Helping our customers buy a diamond is the heart of our mission. Our founder G.W. Haltom called our store “The House of Diamonds” and we continue this tradition today. As members of the Diamond Dealers Club and with multi-generational relationships in the diamond business, we buy each diamond center stone one at a time. There will never be “program” diamond merchandising with average grading and pricing. Signed contracts require our suppliers to provide only conflict-free diamonds. And, we will never show or sell any synthetic diamonds. Our greatest honor is getting a referral from a valued friend and guiding a new Haltom’s customer through their diamond buying process. We exclusively refer to and use the Gemological Institute of America’s diamond grading system. Our diamond center stones of one carat and greater have GIA Diamond Grading Reports, which are the most trusted in our industry. These reports, also called certificates, are critical to us and will help establish authenticity and value in the future. The details on each GIA Diamond Grading Report will also help identify the diamond in the future. Most insurance companies require a copy of this GIA certificate along with a current appraisal to add a diamond to their insured’s insurance schedule. The unit of measure used for the weight of a diamond is the carat. Carat weight can also be divided further by using points. 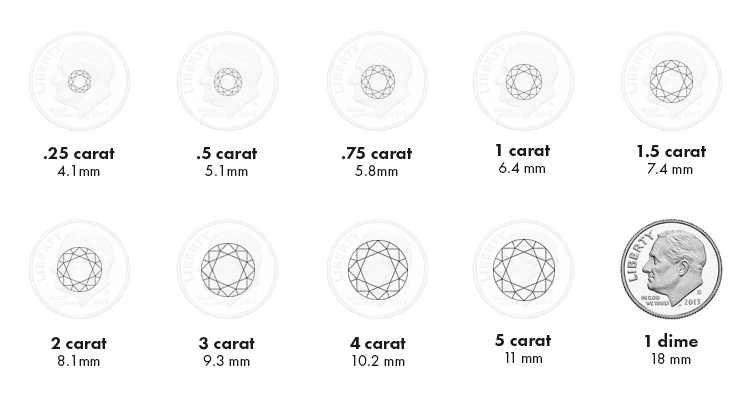 There are 100 points in one carat. So, a 1/4 (.25) carat stone can also be expressed as 25 points. When comparing two diamonds, please note that just because one is twice the carat weight of the other does not mean that it will appear to be twice the size. The cut of a diamond determines its brilliance or sparkle. Each shape will be cut differently. Before a diamond is cut, the location of inclusions and flaws, the natural coloration, and the original shape of the rough stone are studied extensively. The stone facets are then mapped out and cut in a way that maximizes size, shape and clarity. For optimal light performance, you will want a diamond that is cut neither too shallow nor too deep.